In times and contexts where multilingual classrooms and educational settings are the norm, attention to medium of instruction (MOI), and to practices around language use in teaching and learning, is unavoidable. Prioritising one language as the MOI over others arguably has a profound impact on all languages and their various stakeholders in multilingual contexts. MOI policy decisions, their enactments, and how these realise broader geopolitical and socio-political agendas in multilingual contexts present another layer of complexity in questions regarding MOI in multilingual education. MOI is deployed as policy and promoted as practice to pursue diverse objectives, but enactment in classrooms often provokes unexpected outcomes and multilingual practices that illustrate the creativity and resourcefulness of language users. 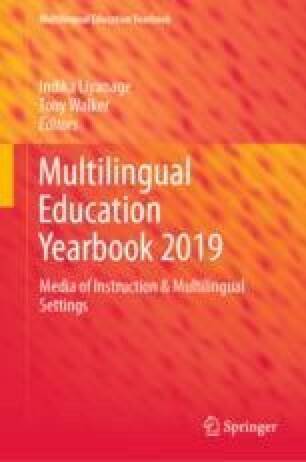 As language users—teaching practitioners and their students—respond to fluidity and complexity in language ecologies of the current multilingualism (Aronin in Learning and using multiple languages: current findings from research on multilingualism. Cambridge Scholars Publishing, Newcastle upon Tyne, UK, pp 1–28, 2015), researchers are in turn responding to investigate and analyse rich sources of data that can reveal the realities of moment-to-moment practices and that can offer new or alternative approaches and responses to the needs of diverse stakeholders. This chapter foregrounds how these challenges and complexities interact in relation to choices, implementations, and enactments of MOI in multilingual settings. It also explores how they impact on educational processes, developments and outcomes, as well as broader social and (geo)political agendas, and contributions researchers make to understand these. Australian Bureau of Statistics. (2017). Cultural diversity. Retrieved from http://www.abs.gov.au/ausstats/abs@.nsf/Latestproducts/2024.0Main%20Features22016. Australian Curriculum Assessment and Reporting Authority. (2011). English as an additional language or dialect: Teacher resource. Retrieved from http://www.acara.edu.au/verve/_resources/EALD_Teacher_Resource_file.pdf. Chapple, J. (2015). Teaching in English is not necessarily the teaching of English. International Education Studies, 8(3), 1–13. https://doi.org/10.5539/ies.v8n3p1. Dearden, J. (2014). English as a medium of instruction: A growing global phenomenon. London: British Council; Oxford University. Retrieved from https://ora.ox.ac.uk/objects/uuid:4f72cdf8-b2eb-4d41-a785-4a283bf6caaa. Fernando, S. (2011, October 26). From dethroning English to planning for a trilingual society: Keynote address by Sunimal Fernando at the 9th International Language and Development Conference on ‘Language and Social Cohesion’, Colombo, October 18, 2011 (Part 3). Daily News. Retrieved from http://www.dailynews.lk/2001/pix/PrintPage.asp?REF=/2011/10/25/fea0. García, O., & Kleyn, T. (2013). Teacher education for multilingual education. In C. A. Chapelle (Ed. ), The encyclopedia of applied linguistics (pp. 1–6). Oxford: Blackwell. Retrieved from https://doi.org/10.1002/9781405198431.wbeal1145. Kosonen, K. (2017a). Language of instruction in Southeast Asia (Paper commissioned for the 2017/8 Global Education Monitoring Report, Accountability in education: Meeting our commitments). Retrieved from unesdoc.unesco.org/images/0025/002595/259576e.pdf. Luo, C. (2014, September 23). One-third of Chinese do not speak Putonghua, says Education Ministry. South China Morning Post (International edition). Retrieved from http://www.scmp.com/news/china-insider/article/1598040/3-10-chinese-citizens-do-not-speak-putonghua-says-education. Macaro, E., Tian, L., & Chu, L. (2018b). First and second language use in English medium instruction contexts. Language Teaching Research, (Published online July 16, 2018), 1–21. https://doi.org/10.1177/1362168818783231. Premarathna, A., Yogaraja, S. J., Medawattegedara, V., Senarathna, C. D., & Abdullah, M. R. M. (2016). Study on medium of instruction, national and international languages in General Education in Sri Lanka. Retrieved from http://nec.gov.lk/wp-content/uploads/2016/04/9-Final.pdf. Simons, G. F., & Fennig, C. D. (2018a). Ethnologue: Languages of the World: China. Retrieved from https://www.ethnologue.com/country/CN. Simons, G. F., & Fennig, C. D. (2018b). Ethnologue: Languages of the World: Indonesia. Retrieved from https://www.ethnologue.com/country/ID. Simons, G. F., & Fennig, C. D. (2018c). Ethnologue: Languages of the World: Sri Lanka. Retrieved from https://www.ethnologue.com/country/LK. Trudell, B. (2016). The impact of language policy and practice on children’s learning: Evidence from Eastern and Southern Africa. Nairobi: United Nations International Children’s Emergency Fund (UNICEF) Eastern and Southern Africa Regional Office. Retrieved from https://www.unicef.org/esaro/UNICEF(2016)LanguageandLearning-FullReport(SingleView).pdf. Wickramasuriya, S. (2005). The present socio-economic-political culture & the myth of English as an access to social equality in post-colonial Sri Lanka. In Proceedings of the 33rd Annual Conference on the Australian and New Zealand Comparative and International Education Society (pp. 166–182). Armidale, NSW, Australia. Retrieved from http://ro.uow.edu.au/edupapers/1146/.